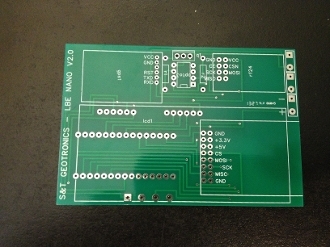 This unique & custom Printed Circuit Board is at the heart of our Product Offering. It allows easy integration of an Arduino Nano, a Parallel LCD (1602 or 2004). a Skylab SKM53 GPS, a SD Card Reader/Writer, an RF24L01+ along with Mosfet, Opto-Coupler, On/Off switch, N/O Pushbutton & 9-Volt battery. It features a space to add a secondary (function) button.